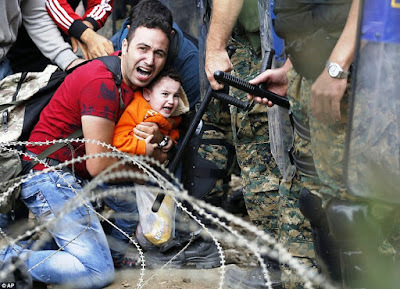 Over the past few days I have been distressed by images on television news and in every newspaper of the refugee crisis in Greece and other parts of southern Europe and the Mediterranean. 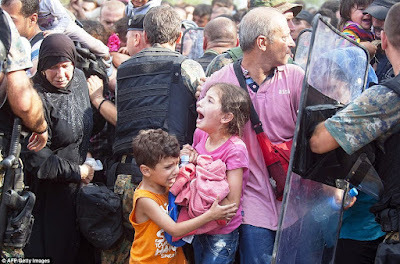 The images of frightened children clinging to each other or bewildered parents, and of vast numbers of people on railway tracks or being held back as razor wire is rolled out, or clambering onto overcrowded trains heading north from the Balkans to Austria or Germany all bring back haunting images of World War II and the concentration camps. Who is listening to these children? Who hears their cries and sees the tears and the fear on their faces? 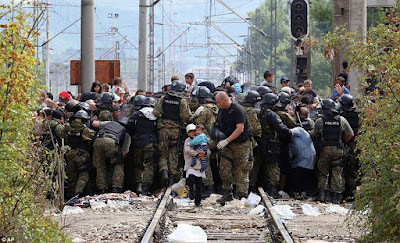 And over and over again, in my mind, in my dreams, I am hearing the words and the music of The Ballad of Mauthausen, a cantata written by Iakovos Kambanellis and Mikis Theodorakis 50 years ago in 1965, 20 years after the end of World War II. The Ballad of Mauthausen (Η Μπαλάντα του Μαουτχάουζεν) is based on the experiences of the Greek playwright Iakovos Kambanellis (Ιάκωβος Καμπανέλλης, 1922-2011), who wrote four poems that Mikis Theodorakis (Μίκης Θεοδωράκης) set to music. Kambanelis was a poet, playwright, screenwriter, lyricist, and novelist, best known as a screenwriter for films, including Stella (1955), directed by Michael Cacoyannis. It was first written the script as a play, Stella With the Red Gloves, based on Carmen, but was never produced on the Greek stage because of its sexual frankness. The film, shot in the streets of Athens, follows a singer (Melina Mercouri) who refuses to marry her lover and begins a passionate affair with a football player. The film made a star of Melina Mercouri and boosted Greek cinema’s international reputation. Kambanelis was born on 2 December 1922 in Hora on the island of Naxos. He was forced to leave school at an early age and to find work after the family moved to Athens, but continued his studies at an evening technical school. He was arrested in 1942 after attempting to flee Nazi-occupied Greece, and was sent to Mauthausen in Austria, where he spent the rest of World War II. Mauthausen-Gusen was about 20 km east of Linz in Upper Austria. Unlike Auschwitz, it was not an extermination camp, but countless people were murdered and died there in horrific circumstances. 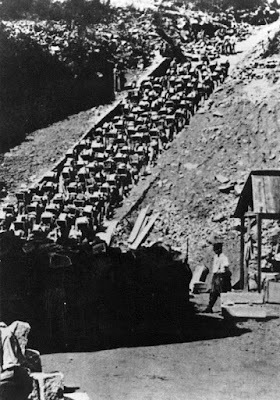 There the Nazis forced their victims to work in a stone quarry, hauling large pieces of rock and stone up the “Stairs of Death” along steep and uneven ramps. The Jewish prisoners there included Simon Wiesenthal, along with Jehovah’s Witnesses, Romanies and Spanish republicans. 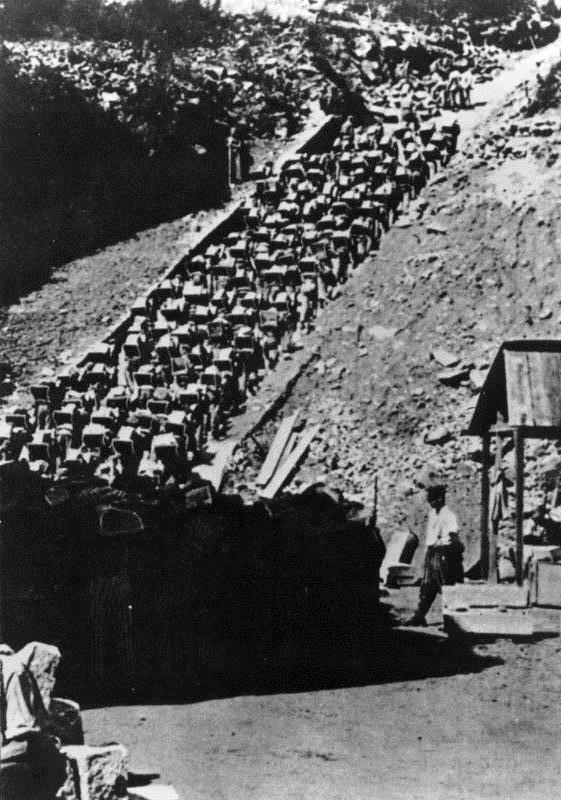 Between 240,000 and 320,000 people, including Jews, intellectuals, and people classified as political “undesirables,” were murdered in Mauthausen. Kambanelis owed his survival in Mauthausen to the protection of a philhellenic German prisoner who assigned him to the architectural drafting office, where additions to the camp were designed. Mauthausen was the last of the concentration camps to be liberated in May 1945. Kambanellis was not a Jew, and he was free to return with the other Greek prisoners to Greece. But knowing there were Greek Jews who dreamed of reaching Palestine, he elected to stay on in the camp until the last Greek Jew left. On his return to Greece, Kambanellis began writing a newspaper column in Athens before turning to the theatre and film. A recurring feature of his work is the use of multiple, often unexpected voices. He attributed this to the years he spent in Mauthausen, listening to the voices of nameless sufferers. His success as a writer seemed miraculous to him and perhaps contributed to his unique blend of realism and mysticism. His most successful play, Our Grand Circus, was staged in 1973 at the height of the colonels’ dictatorship. Weaving history, myth, and the traditional shadow puppet theatre with folk motifs, the play ridicules the heroic view of Greek history favoured by the colonels, rewriting Greek history from a left-wing perspective. 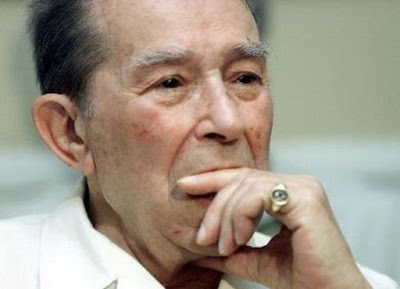 By calling the performances a circus and transforming his bleak view of the regime and of Greek history into a series of amusing vignettes, he escaped the strict censorship of the time. Our Grand Circus broke all box-office records and made Kambanellis a popular symbol of resistance. He wrote the scripts for about a dozen films and directed two of them. He died in Athens on 29 March 2011. He is regarded by many as the greatest Greek playwright of the 20th century. Mauthausen, his only novel, is a memoir recalling his experiences in the concentration camp. It was first published 50 years ago in Athens in 1965 and has been translated into English and German. At the same time, he wrote the Mauthausen cantata with a setting by his close friend Mikis Theodorakis, when his publisher suggested that they publish their works together. The book and the music were born in an incendiary political and cultural milieu in Greece. Two days after its first performance, all music by Theodorakis was banned from Greek state radio. Within two years, the military had seized power and the colonels silenced Theodorakis and many other voices for seven long years. Kambanellis was inspired by a photograph of an unknown girl which he found in the camp and which he kept with him. The memoir begins in the camp and the neighbouring villages in the weeks immediately after their liberation. The horrors the inmates have seen and have suffered are recalled by the author and the woman he falls in love with, a Lithuanian Jew, in merciless detail as the lovers exorcise their demons by revisiting the sites of the atrocities they witnessed. When the inmates are gradually repatriated, many of the Jews wait to find a way to get to Palestine. The second song, O Αντώνης (O Antonis, “Adonis”) is also known from the score of the film Z. This song tells the story of a Jew who collapses on the “Stairs of Death” at the base of the quarry and is shot by the guard who then orders the Greek prisoner Antonis to lift a double burden or he too will be shot. Antonis lifts this second rock and defiantly walks on with it. In this song we also hear the stairs being depicted in the introduction to every couplet. The third song, Ο Δραπέτης (O Drapetis, The Fugitive), is the story of a prisoner who escapes the camp but cannot find refuge in the hostile surroundings. He is captured again and is shot. The introduction to this song depicts the landscape of Austria with a Mozart-like melody. In the last song, Όταν τελειώσει Ο Πόλεμος (Otan Teliossi O Polemos, When the War Ends), the poet addresses one of the girls he sees standing by the fence of the female camp and asks whether they can come together when the war is finally over, kiss at the gate, make love in the quarry and in the gas chamber until the shadow of death is driven away. The song ends with an epilogue, returning to the first song and ending with the plaintive words that no-one knows how beautiful my beloved was. The instrumentation includes bouzoukis, spinet, electric guitar, baglamas, flute, bass and percussion, all helping to create a desolate yet beautiful atmosphere. Greek popular music in the 1960s became known all over the world thanks to the scores by two composers in particular, Manos Hadjidakis and Mikis Theodorakis for two popular movies, Never on Sunday and Zorba the Greek. Both worked in the laika tradition of Greek popular music influenced by European melodic form. Each had his own muse or angel in a female singer who interpreted his music – for Hadjidakis she was Nana Mouskouri, for Theodorakis she was Maria Farandouri. The recording of The Ballad of Mauthausen marked the beginning of one of the most fruitful collaborations in Greek music. Mikis Theodorakis discovered the singer Maria Farantouri when she was a 16-year-old young singer. He is said to have told her at the time: “You will be my high priestess.” Her unique dramatic voice and style complements his music, and it is so productive a partnership that it has lasted for half a century. Listening to The Ballad of Mauthausen, it is difficult to grasp that this is the voice of a teenager who has just left school, for she sings with a raw force and energy that reaches into the heart and soul with intensity. Farandouri and Theodorakis had a life-long musical collaboration, intensified by their shared political activism. This album is both a classic and the high point of that collaboration. Farandouri’s voice is a marvel of depth and beauty, and the songs are among the best by Theodorakis. The power and majesty of his music combined and the soaring beauty of her voice make The Ballad of Mauthausen a profound testament to the power of human resistance to tyranny and oppression. 5, Κουράστηκα να σε κρατώ (Kourastika na se Krato, “I Am Tired of Holding Your Hand”). 6, Ο ίσκιος έπεσε βαρύς (O Iskios Epesse Varis, “The Shadow is so heavy”). 7, Πήρα τους δρόμους τ' ουρανού (Tous Thromous T’Ouranou, “I Took to the Streets of Heaven”). 8, Στου κόσμου την ανηφοριά (Stou Kosmou Tin Aniforya, “The Uphill Road”). 9, Το Εκκρεμές (To Ekremes, “The Pendulum”). 10, Τ' όνειρο καπνός (Tóniro Kapnos, “Dreams Go up in Smoke”). The Ballad of Mauthausen is a difficult poem to read and a difficult cantata to listen to, and yet is compelling. It is difficult to realise how a poet could be inspired to write about love in the all-encompassing atmosphere of evil and death in a concentration camp. Yet this is the dream of love, and love is the way a great soul not only survives such terror, but finds meaning and triumphs over it. Can love triumph in the present crisis? βόηθα ν’ ανέβω τη σκάλα. μες στα χωριά του κάμπου τρέχει. και ρούχα για ν’ αλλάξω. θεριό για να σας φάω. στου Μπέρτολτ Μπρεχτ τη χώρα. για σκότωμα τον πάνε τώρα. ώσπου ν’ αφανιστεί η σκιά του. have you seen by chance my love? nor a little comb on her hair. at the marble threshing circle. can’t stand the barbed wire. runs through the villages of the valley. and lakes to fly across. no beast come to eat you. to go back to my home. in this land of Berthold Brecht! They’re taking him, now, to be killed. Girl with the frozen hands. Forget me not when the war is over. So that we could embrace in the street. So that we could kiss in the square. So that we could make love in the quarry. On the staircase, in the observation post. ’Til its shadow will be no more.